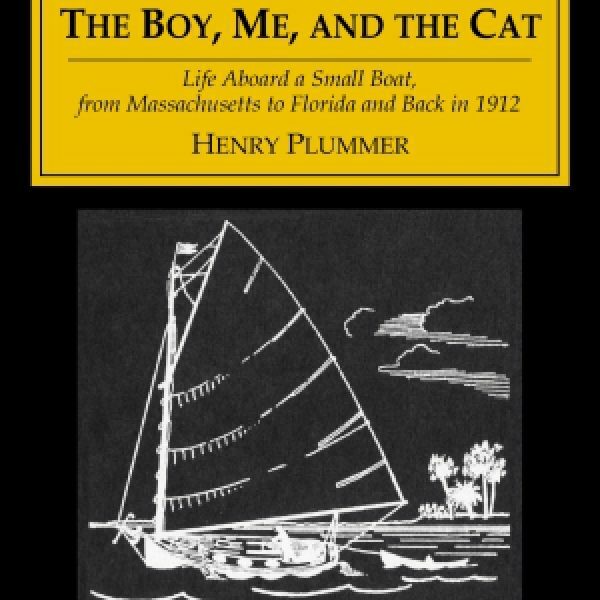 This is Henry M. Plummer’s idiosyncratic log of his 1912-1913 sailing adventure in the Mascot, a 24-foot Cape Code catboat. 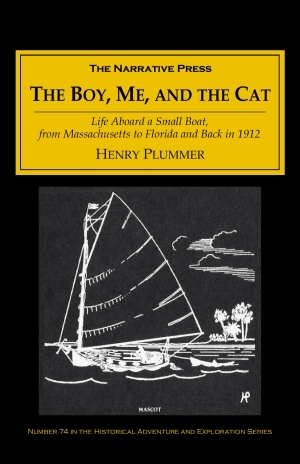 With his son, Henry Junior, and Scotty the cat, Plummer worked his way down from Buzzard’s Bay, Massachusetts, to Miami, Florida, and back – a round trip of nearly 3,000 miles. The Mascot is an old-fashioned Cape Cod catboat 30 years old. Her dimensions are, length overall 24 ft. 6 in., waterline 23 ft., beam 10 ft., draught 3 ft. 6 in. With self-bailing cockpit she is as safe and able a little ship as a man could want to go to sea in. … and then came a big comber to which we rose, and crunch-o, the nose of the launch went through our bilge for a 6 in. hole. Up she went again, and bang-o there was another hole. My eye! We would soon be a pepperbox at that rate. … Things were getting interesting. I ran below for hammer, tacks and canvas. Water already over cabin floor. With the last of daylight and using his hammer under water, Henry cleverly put on a canvas patch. We sounded pumps and after half an hour they sucked. Some relief to that sound. Believe me. 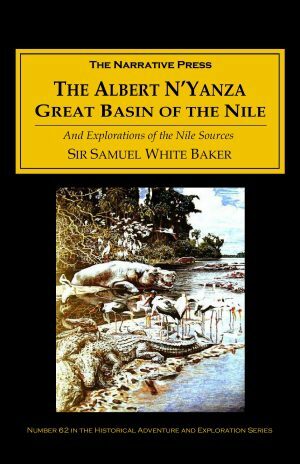 Plummer’s appreciation of nature is always present in the log. May 19th. The sweetest, prettiest spring morning that God’s sun ever shone on. The air so cool and fresh, the sunshine so bright and warm. We entered the Delaware and Chesapeake canal where it was still more beautiful with the Scotch broom a glorious yellow and all the other flowers nodding from the banks. The canal itself taking reflection of the mass of foliage was an indescribable, translucent green and all the world was wonderful. The Boy, Me, and the Cat is one of the finest cruising narratives any sailor ever put to paper.